Come join the Elon Women’s Basketball Staff for individual and team camp sessions that are designed to help teach young players individual skill sets, develop the mindset of a college level player, and create a learning environment that is interactive and exciting. The Elon Phoenix Women’s Basketball Camps are dedicated to providing an opportunity for players of all levels to develop and improve their basketball skills through instruction and on-court experiences while also incorporating off-court life skills. We hope all campers will acquire an appreciation for teamwork, sportsmanship and the enjoyment of the competition that comes with the game of basketball. This action-packed day camp will give campers the experience of what it means to be a member of the Elon Women's Basketball team. Camp activities will focus on basketball fundamentals and developing a team mentality, as well as individual offensive and defensive skill sets and shooting techniques. The coaching staff and current and former Elon Women's Basketball players will be giving individual instruction to the campers to ensure that every camper leaves with the tools to become a better basketball player. Each camper will receive an Elon Women's Basketball t-shirt. The Elon Women's Basketball team camp is designed to give middle school, junior varisty, varsity, and club teams the opportunity to play multiple games against other teams of similar ability. Teams will be divided into leagues by competition level and/or coaches' choice. Awards will be given out at the conclusion of camp to the best offensive team, best defensive team, and the team with the best sportsmanship in each league. There will also be coaches clinics and question and answer sessions with the players and staff. Each camper will receive an Elon Women's Basketball t-shirt. Each team is guaranteed six games with certified officials. Coaching clinics and a coaches' social will be offered. Meals: Breakfast will be served each morning at the Best Western Hotel. All other meals (Dinner on 6/21 and 6/22 and Lunch on 6/22) will be served in Lakeside Dining Hall. Housing: Campers and coaches will stay at the Best Western Hotel (770 Huffman Mill Road, Burlington, NC). Camp staff will also be residing in the hotels. Transportation will be provided between the hotels and competition venues. This camp is designed for the advanced and serious-minded high school basketball player who is serious about playing at the collegiate level. Our elite position camp is a half-day (1-5 PM) camp where we spend time giving players the true Elon playing experience. Our drills and acitivites are designed to offer a day in the life on an Elon basketball player. We teach everything from the basic fundamentals to more advanced skills with our Elon Fastbreak series. Instruction by Elon Women's Basketball players and staff will focus on fundemantals specific to your position, shooting technique and footwork. The camp runs from 1pm-5pm each day. 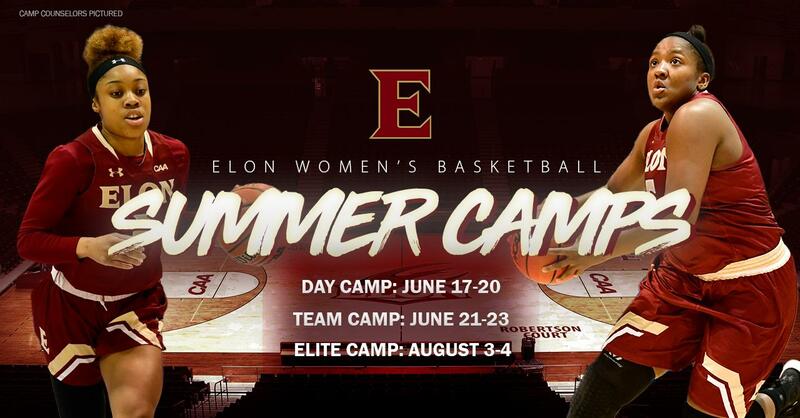 All campers will receive an Elon Women's Basketball t-shirt. All campers must have a copy of their health insurance card, participant information form and insurance waivers on file before participation in any camp is permitted. It is encouraged to sent this information in prior to the day of registration. The participant information form and insurance waiver form are attached below. Online payment is accepted only for Day Camp and Elite Camp. Walk-in registration is welcome for both Day Camp and Elite Camp. The only methods of payment that will be accepted at walk-in registration are cash, check or money order. Please contact Stephen Fishler at sfishler@elon.edu if you intend to pay at registration. All individual cancellations must be received in writing by mail, email or fax to Stephen Fishler and the Elon Women's Basketball office. Full refunds can be made up until 48 hours prior to the start of camp. The postmark of the cancellation letter/email will determine the date the refund request was received. Any refund request not submitted 48 hours prior to the first day of camp will not receive a refund. Additional refunds may be given based on extenuating circumstances at the discretion of the camp director. No refunds will be given for the team camp registration fee or for a player that has been injured at camp.